You are here: All parts together.. It is not enough to define all the parts if one wishes to gain knowledge of the exact way a speaker system really works. Sometimes it is helpful to trace the path of the signal, the electrical signal. Let us try it. The amplifier channel sends an electrical signal through the cable. It arrives at the binding posts and flows (inside the speaker enclosure) through a polarized (ie. signed through a colour scheme) cable to the crossover assembly. This signal is simultaneously fed to the inputs of all the crossover filters. Let us assume we have a three-way speaker. The LPF strips input signal from its mid- and high-frequency range. Only low frequencies pass through and emerge in its output. This output is sent tthrough a polarized cable to the woofer driver. The HPF strips input signal from its low- and mid-frequency range. Only high frequencies pass through to its output. This output is similarly sent to the tweeter driver. Finally the BPF strips input signal from both its low- and high-frequency range. Only mid frequencies pass through. This output is sent to the midrange or squawker driver. -How does a loudspeaker produce sound waves? The electrical signal fed to the terminals of a loudspeaker is actually a voltage. It creates a current that flows into the voice coil of the loudspeaker. This coil is floating inside a strong magnetic field. As a result a strong force is exerted upon it making it vibrate. (The picture on the left is provided by caraudio.com and illustrates a woofer with its magnet removed). 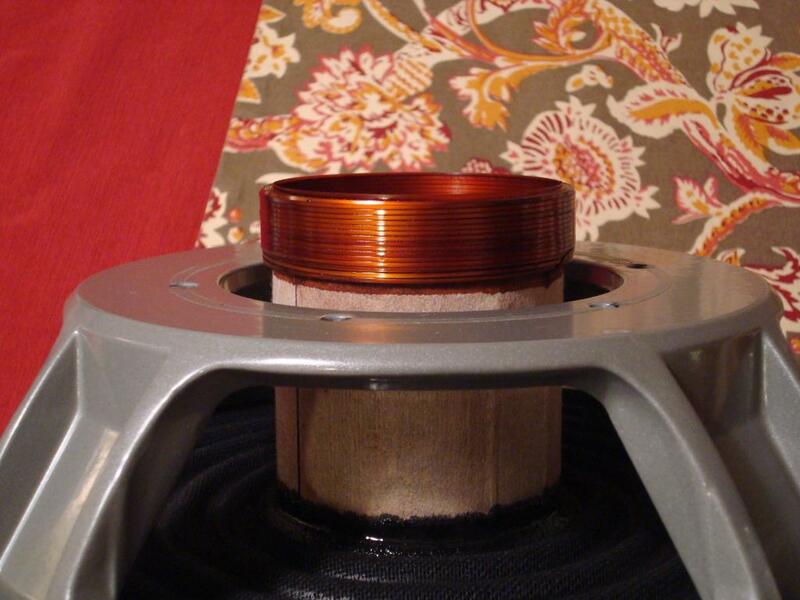 In all loudspeakers the voice coil is wound around a small but unexpectedly rigid cylinder called "former". Former is firmly placed in the middle of a stiff suspension (the yellow wavy textile which acts like the suspension coil of automobiles). Its vibration is controlled and transmitted to the base of the drivers cone. It is this vibration that acts as a sound source, that emits waves. -Why not having a single loudspeaker ? Well, it has been noticed that small cones, whatever the amplitude of their vibration, can not produce low frequency sound waves of adequate intensity. In addition diaphragms with large diameter are heavy enough not to be able to vibrate with an increased amplitude. If we add all these together we can understand why woofers have large cones and tweeters have very small domes. Cones and domes are all emitting diaphragms for us. Woofers have no problem with their heavy cones (10-100gr) as they are expected to vibrate at low frequencies only. In a similar way lightweight tweeter domes (1-4gr) can efficiently vibrate even at frequencies above 20000Hz ! -What about the inner part of the speaker's enclosure? Tweeters are sealed at their back. Woofers and Midranges (Squawkers) are open at their back and therefore emit another sound wave towards the inner cavity of the speaker's enclosure. This wave consists of a wide range of frequencies. In general the damping material that has been lined on the cavity walls manages to absorb sound frequencies above 800Hz. These frequencies are therefore effectively attenuated (provided there is adequate damping material inside this cavity). Sound waves of frequencies 20-800Hz approximately propagate in the enclosure cavity, reflect at the walls and form a special effect known as "standing wave". A part of this formation pushes itself into the bass reflex port (vent) and comes out of it. The waves emitted by the mouth of the bass reflex port are actually filtered by the cylindrical shape of the tube. Thus their spectral content is gothered around the very low frequency range (10-60Hz). -So what is actually going around a real speaker box? A real speaker is a device with multiple sound sources: Each loudspeaker and vent operates as a separate sound source.The waves of all these sources add in the space around the box. This sort of wave "superposition" has its own rules allowing for a successful "sound image" reconstruction in three-dimensional space (or ..not). No they are not. In many cases we will not be able to find a port. 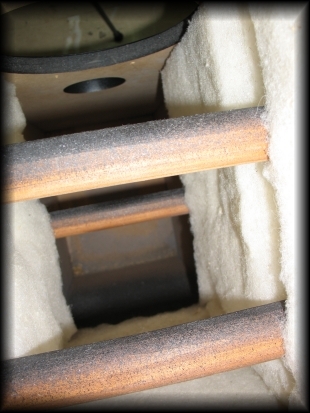 In some cases there is not even a cavity; just a flat baffle and an open speaker scheme. There is a vast ocean of design platforms in the world of high fidelity speakers.